YOUR news belongs here too! Write to us at etapi-stti@uwosh.edu to tell us about your nursing career so far. Mike Mason's first nursing position as a new graduate was in the ICU at St. Elizabeth Hospital in Appleton Wisconsin. He is currently employed as an ICU nurse at St. Agnes Hospital in Fond du Lac Wisconsin. Mike plans to apply to UW Oshkosh's CRNA program in the near future. Mike attends Eta Pi board meetings and functions whenever possible. He encourages other nurse leaders to join Eta Pi as well because "being actively involved in an organization like Eta Pi allows me to network with other nurses who have the same professional goals that I have. One of the great things about nursing is all the different avenues you can explore, whether that be bedside nursing or education or an advanced practice degree. Being an Eta Pi member gives me a sense of direction and gives me opportunities to continuing growing as a nurse". Clarissa Rueckert is a member of the UW Oshkosh College of Nursing Traditional BSN graduating class of Spring 2017. She is from Albany, Wisconsin. She was inducted into the Eta Pi Chapter in April 2016. Clarissa comes from a family of teachers, but she decided that nursing was the perfect career for her because it combines the opportunity to educate patients in addition to performing complex nursing skills. 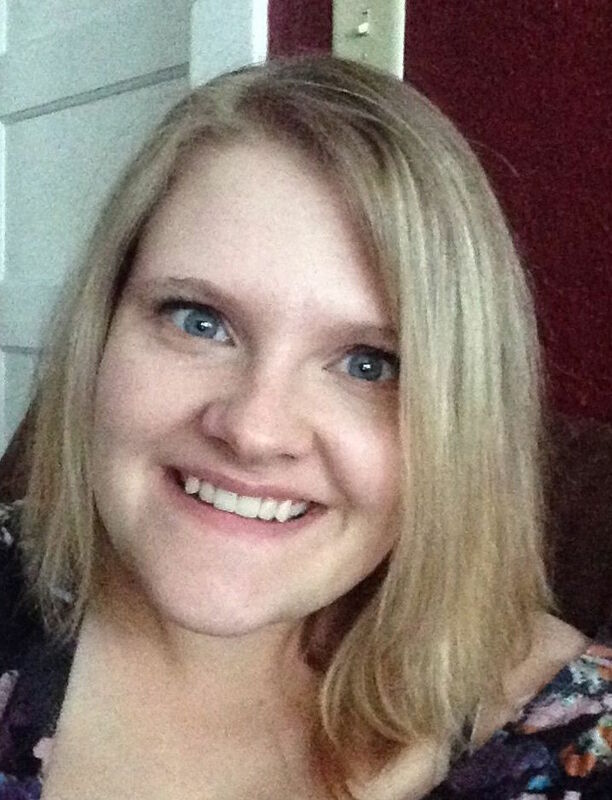 Being a member of Eta Pi helped her to think about the value of research, as well as connect her with other professors at UW Oshkosh she did not get to know through her undergraduate classes. Clarissa also enjoys the newsletters that Sigma Theta Tau sends out with interesting articles. Clarissa will begin her first RN job as a Nurse Resident at UW Health, starting in September 2017. Her future education goals include going back to school to become a Nurse Educator. Clarissa feels this is one way that she can help to excite new nursing students about all that nursing has to offer. "I am proud to be a member of Sigma Theta Tau International, as it allows me to stay up-to-date on new happenings in the profession. I believe it will also allow me to stay connected to my peers after graduation, as well as push me to become the best nurse that I can be! 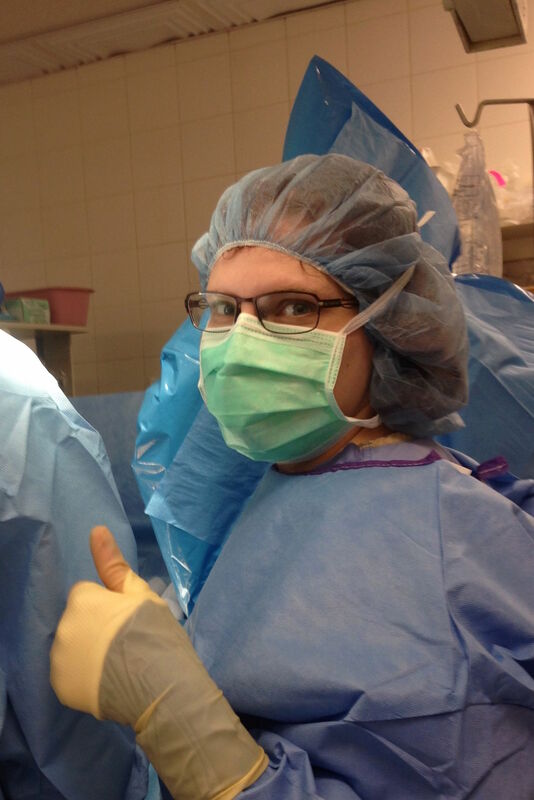 My dream job would be as an operating room nurse, and eventually I plan to go back to graduate school to become an Advanced Practice Nurse Practitioner, specializing in surgical services." "I am Nurse McSnuggles. My job involves caring for the one of the most vulnerable populations on the planet. I work with premature babies as early as 23 weeks gestation and also full-term babies who have birth complications. My job isn't a job--it's a career. I'm constantly learning and there are so many ways to advance. It is an ICU so I deal with very sick babies, but I also discharge a lot of healthy babies home who grew so much in the time they were with us." 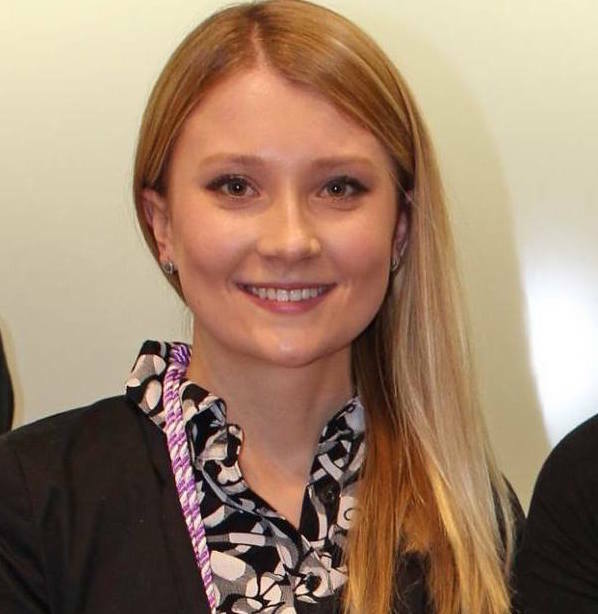 Ashleigh says that she loves being involved in the Eta Pi Chapter because it allows her to stay connected with UWO, and that being on the board of Eta Pi provides networking and learning opportunities that are important in the advancement of her nursing career. The Eta Pi board loves the energy, youth, and enthusiasm that Ashleigh brings. If you follow the Eta Pi Chapter on Facebook, Ashleigh is the person bringing you all of the posts and updates. Along with Dr. Suja Shanmugasundaram, Ashleigh represented the Eta Pi Chapter at the Sigma Theta Tau International 43rd Biennial Convention in Las Vegas, Nevada in November 2015. Ashleigh's hometown is Waukesha, Wisconsin. She bought her first home there with her husband, and says she has planted her roots for good! She loves to travel, and someday hopes to travel across Europe and revisit Peru, where she had her Senior I Community Health Clinical during her BSN education. Her future education goals include going to graduate school to become a Neonatal Nurse Practitioner (NNP), and to earn her Doctor of Nursing Practice (DNP) degree. Stevie Steiro is a graduate of the UW Oshkosh College of Nursing Traditional BSN Class of December 2015. She is from Green Bay, Wisconsin. She was inducted into the Eta Pi Chapter in April 2015. Stevie comes from a family of volunteers--her family made volunteering a priority and a way of life when she was growing up, and she has loved every experience and connection that she made along the way. As the Eta Pi Membership Ambassador, Stevie would like to get members more involved with the chapter and to help our chapter become more engaged with the community through volunteer activities. As the chapter's Webmaster, Stevie would like to keep members updated about the chapters activities. 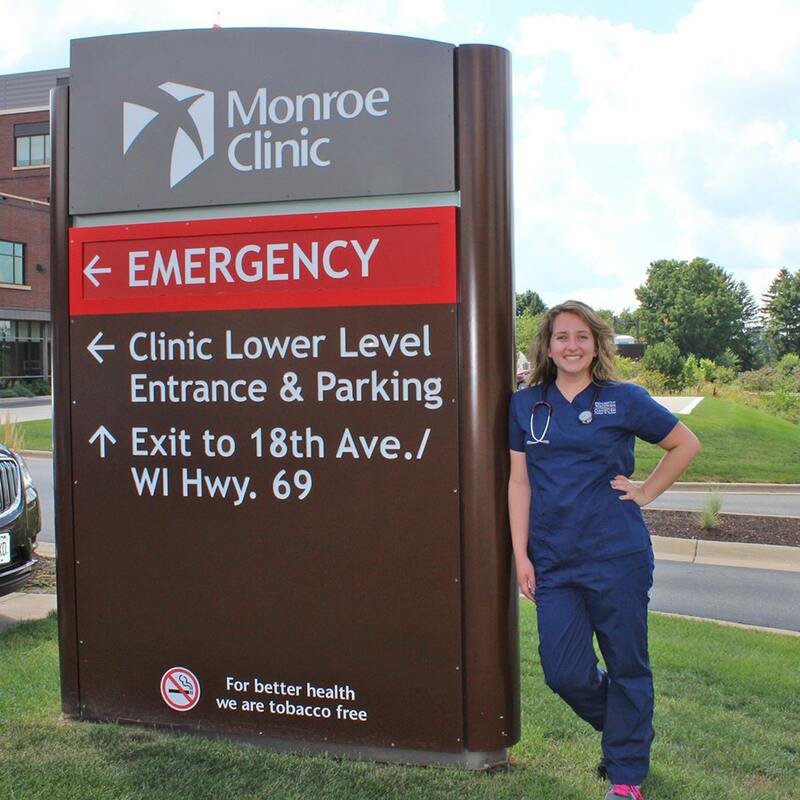 Stevie is currently employed as a Nurse in the Cardiovascular Intensive Care Unit at Aurora St. Luke's Hospital in Milwaukee, Wisconsin; she is enthusiastic about her job and enjoys the intellectual challenge critical care provides on a daily basis. Her long-term goal is to become a CRNA. Left: Stevie playing with a young patient prior to a surgical procedure in Haiti. 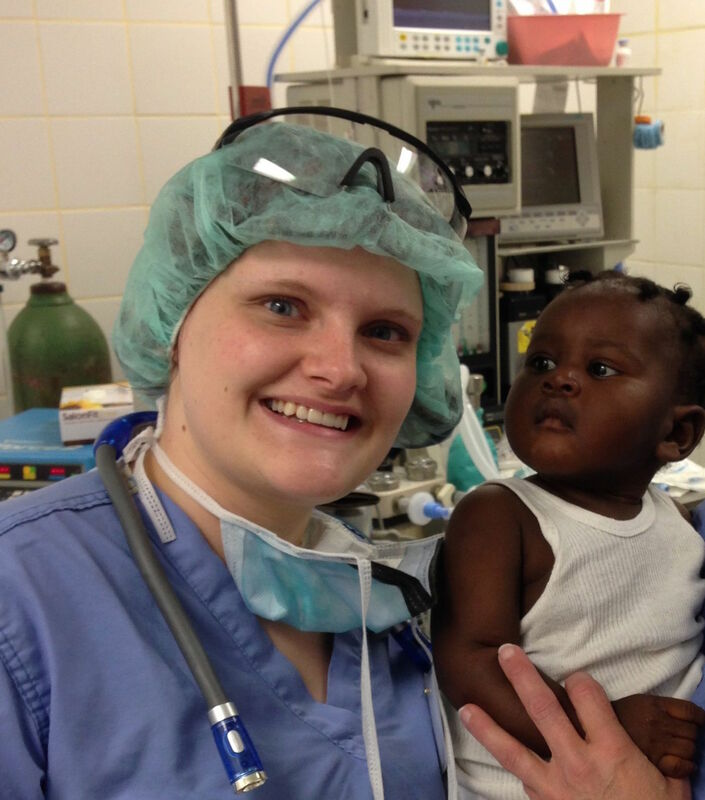 Right: Stevie assisting with a surgical procedure during a volunteer medical trip to Haiti. Sara Surdyk is the Archivist for the Eta Pi Chapter. 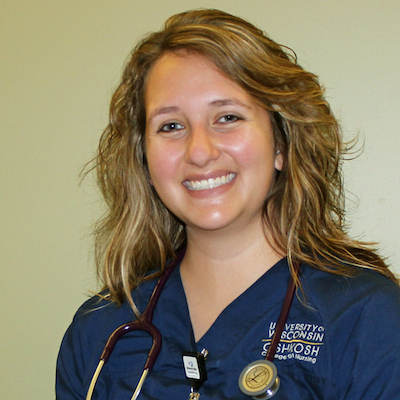 Sara is a May 2015 UW Oshkosh College of Nursing BSN Graduate, and she is from Hartland, Wisconsin. She is employed in her first RN job at Appleton Medical Center on the surgical floor. Sara says that she is excited to be a part of Eta Pi to stay connected with the UWO College of Nursing and to stay up to date in the changing nursing world. She was inducted into the Eta Pi Chapter in May 2015, and we are very happy that she was willing to jump in to volunteer right away! As Archivist, Sara is in charge of organizing our Eta Pi Chapter records, statistics, photos and other historical items that have accumulated over the years. We now have a dedicated Eta Pi room in the new College of Nursing area in Clow. We welcome any volunteers who would like to be a part of this history for the Eta Pi Chapter by helping to organize our collection in our new space or to contribute to recording the history of the Eta Pi Chapter! Contact us at etapi-stti@uwosh.edu if you can volunteer. Let us know about what you have been doing in your nursing career. Nothing is too small to tell us about. Remember, we are all nurses and we cheer all nursing accomplishments!